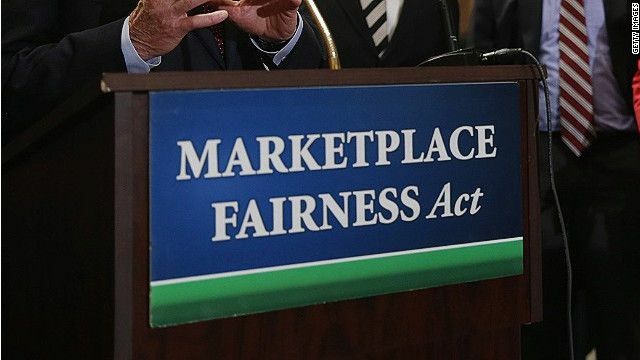 The Marketplace Fairness Act, commonly referred to as the "internet tax," is currently in the Senate and appears likely to pass when it comes up for a vote May 6th. This means every business we buy from online will have to collect and remit sales taxes to our state. The bill itself is quite simple. Currently, only online retailers with a physical presence in the state you live are required to collect and remit sales taxes for your online purchases. So if you have a Best Buy in your state and you order from BestBuy.com, BB collects the sales tax from you. If you don't have a BB in your state, BB is not required to collect the sales tax. If this bill passes, businesses with more than $1M in annual sales will be required to collect and remit sales taxes to all states with sales taxes. While proponents of the law claim that this levels the playing field for brick-and-mortar stores, this bill actually moves the needle in the other direction. Let's say I operate a physical store selling goods. In the operation of that business I have to worry about one taxing jurisdiction -- the one my physical store is located in. If I sell those same goods online, this bill would require I worry about over 9,000 taxing jurisdictions. The bill does exempt business that do less than $1M in sales, but that will either force a business to stay small or absolutely crush it with compliance costs on that first dollar above the threshold. That's part of why companies like Amazon support this bill -- they're large enough to be able to absorb the compliance costs while their smaller competitors can't. If I travel to another state and make a purchase, the store doesn't ask me where I live and then collect and remit sales tax to my home state. To the contrary, the store collects and remits sales taxes based on its physical location. Under this bill however, online retailers would have to collect and remit taxes based on the buyer's location. That set's up a state sovereignty issue where a business located in PA, for example, would be subject to the laws of the State of NC -- imposing a taxing burden without representation. Since Congress appears it's going to do something, the least they could do would be to pass a bill that treats all retailers fairly -- treat online retailers like brick-and-mortar stores. That means charge sales tax based on the location of the business. So if I buy something from a business in Wichita, KS, I pay whatever the sales tax rate is for that city. The online business is now just like any other local business. Perfect? No, there are still potential issues, but it's a far superior option to the current proposal.